Following completion of repairs to the new cracks found on three stringers in the intertank region of STS-133 (Discovery), NASA managers are expected to make a decision by Monday on which of three options to carry out: 1) fly with no additional modifications to the tank, 2) adding what are called “radius blocks” or 3) adding “radius blocks with Z straps” on the stringers. Thanks to congressional inaction, NASA must continue to fund its defunct Ares I rocket program until March, a requirement that will cost the agency nearly $500 million at a time when it is struggling with the expensive task of replacing the space shuttle. NASA has completed its latest round of X-ray scans on the space shuttle Discovery’s external fuel tank, only to find more small cracks on the beleaguered tank’s support beams, the space agency announced today. The four new cracks were discovered on the tops of three metal ribs on the back side of the tank’s midsection, opposite from Discovery. Shuttle program managers met today and elected to repair these fresh fractures in the same way that earlier cracks found on the tank were fixed. This work will likely begin Jan. 3, and is estimated to take two to three days. Arianespace has launched two communication satellites on their Ariane 5 rocket. The Kremlin sacked two top space officials held accountable for a rocket crash that set back Russia’s plans to complete a constellation of orbital navigation satellites to rival the US global positioning system. A Russian rocket carrying three Glonass satellites into orbit veered off course shortly after blastoff from the Baikonur space centre in Kazakhstan this month and plunged into the Pacific Ocean, 1,000 miles north-west of Hawaii. Ten years ago, on Dec. 30, 2000, NASA’s Cassini spacecraft made its closest approach to Jupiter on its way to orbiting Saturn. The main purpose was to use the gravity of the largest planet in our solar system to slingshot Cassini towards Saturn, its ultimate destination. But the encounter with Jupiter, Saturn’s gas-giant big brother, also gave the Cassini project a perfect lab for testing its instruments and evaluating its operations plans for its tour of the ringed planet, which began in 2004. Can reanimated corpses ever really be brought back to life? In the case of the Intelsat Galaxy 15 satellite that had its “brains fried” by a solar flare nine months ago, it would appear that zombies really can be brought back from the dead. Amazingly, the “zombiesat” is back online, communicating with mission control and there’s real optimism it might be brought back to full service! Pending the successful outcome of STS-133′s External Tank (ET-137) clearance for flight, managers have created a preliminary schedule for Endeavour’s realigned milestones. Currently, STS-134′s April 1 launch date is only a placeholder, but remains a target that can be achieved – providing Discovery doesn’t slip from her early February launch window. International Launch Services (ILS) have launched their Proton-M rocket on Sunday, on a mission which is marking the quick return to flight for the Russian workhorse which suffered from a failure during a recent government launch. Launched at 21:51 GMT from the Baikonur Cosmodrome in Kazakhstan, the Proton deployed the KA-SAT communications satellite for Eutelsat, after what was nine hours of flight. 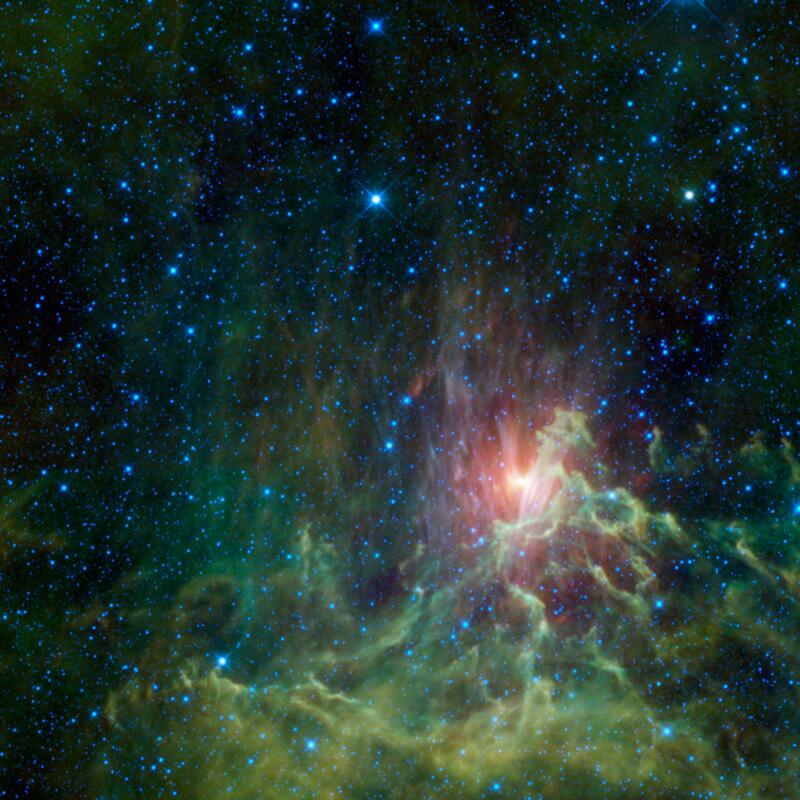 NASA’s Wide-field Infrared Survey Explorer, or WISE, captured this view of a runaway star racing away from its original home. Seen here surrounded by a glowing cloud of gas and dust, the star AE Aurigae appears to be on fire. Appropriately, the cloud is called the Flaming Star nebula. India’s largest rocket lost control and erupted in a fireball Saturday, dealing another blow to the country’s space program after back-to-back failures of the Geosynchronous Satellite Launch Vehicle. The GSAT-5P satellite was lost. A lean team of Lockheed Martin engineers is taking fuel efficiency to new heights. Flight controllers here are meticulously managing what little fuel is left inside the Stardust spacecraft speeding toward a Valentine’s Day rendezvous with Tempel 1, a ball of ice and rock bombarded by a manmade impactor five years ago. As the International Space Station prepares to enter a new era of governmental (ATV, HTV, and Progress) and commercial (SpaceX’s Dragon and Orbital’s Cygnus) unmanned resupply services, the ISS Program (ISSP) is pressing ahead with three software upgrades for the Space Station – which are aimed at accommodating multiple visiting vehicles at a single time, improving visiting vehicle communications, and correcting issues identified during previous visiting vehicle missions to the orbital outpost. Following the postponement of the launch on Sunday due to a leak in the valve of the second stage, the Indian Space Research Organisation (ISRO) said Wednesday it was prepared for the launch of GSAT-5P, an advanced communications satellite. Newly released for the holidays, images of Saturn’s second largest moon Rhea obtained by NASA’s Cassini spacecraft show dramatic views of fractures cutting through craters on the moon’s surface, revealing a history of tectonic rumbling. The images are among the highest-resolution views ever obtained of Rhea. Looking like space slug hidey-holes from Star Wars, huge pits gouge a bright, dusty plain near the Martian volcano Ascraeus Mons in a picture taken between October 1 and November 1 by NASA’s Mars Reconnaissance Orbiter (MRO). Total lunar eclipse coincides with Winter Solstice for first time in 372 years. Space shuttle Discovery is scheduled to roll back from Launch Pad 39A to the Vehicle Assembly Building (VAB) at NASA’s Kennedy Space Center in Florida for additional work related to its final scheduled mission. The first motion of the shuttle is targeted for 12:30 a.m. EST on Tuesday, Dec. 21. In the VAB, technicians will scan below the foam insulation surrounding the intertank section of Discovery’s external tank to look for any issues, such as cracks. They also will reapply foam after removing 89 sensors from the tank’s aluminum skin following an instrumented tanking test on Dec. 17. The launch of Geo-synchronous Satellite Launch Vehicle (GSLV-F06) with the satellite GSAT-5P on board, slated to take place from Sriharikota at 4.01 p.m. on Monday (December 20), has been postponed. The Indian Space Research Organisation (ISRO) took this decision after its rocket technologists detected on Saturday evening the leak of helium gas from one of the valves in the Russian upper cryogenic stage of the vehicle. The leak rate was on the higher side. The leak was noticed during the pre-countdown check of the vehicle. NASA has granted funding for the WISE infrared telescope to finish an extra full sky scan, giving scientists an additional opportunity to comb the inner solar system for hard-to-see asteroids that could threaten Earth. Engineers have gathered detailed data on the thermal and stress environments of the External Tank’s intertank stringers at the LOX flange and LH2 flange areas. NASA managers completed fueling Discovery’s External Tank with nearly 535,000 gallons of liquid hydrogen and liquid oxygen, with a smooth Tanking Test that culminated in a GLS (Ground Launch Sequencer) cutoff at the T-31 second mark at 14:24 EST. Another Chinese Beidou navigation satellite soared into space Friday, the fifth craft to join the country’s fleet of positioning satellites in 2010. Soyuz TMA-20 spaceship carrying an international crew has docked with the International Space Station (ISS). A NASA test at Kennedy Space Center today could help clear the way for the planned launch in early February of space shuttle Discovery’s 39th and final flight. More than 500,000 gallons of supercold propellant will be loaded into the shuttle’s 15-story external tank as engineers try to determine what caused cracks in structural braces in its aluminum-lithium hull. A second look at a group of massive young galaxies 11 billion light-years away has revealed these juvenile giants in the throes of a celestial baby boom, birthing stars at an astonishing scale and rate. NASA announced that an international team of scientists studying remnants of an asteroid that crashed into the Nubian Desert in October 2008 has discovered that it contained at least 10 different types of meteorites. Some of them contained chemicals that form the building blocks of life on Earth, and those chemicals were spread through all parts of the asteroid by collisions. The Russian Soyuz TMA-20 spacecraft blasted off to the International Space Station today (Dec. 15), launching three new crewmates to the orbiting outpost. The launch was from the Baikonur Cosmodrome in Kazakhstan at 2:09 p.m. EST (1909 GMT) with NASA astronaut Catherine Coleman, Russian cosmonaut Dmitry Kondratyev and European Space Agency (ESA) astronaut Paolo Nespoli. Kondratyev is commander of the two-day Soyuz trip to the International Space Station. The trio is expected to dock at the station on Friday (Dec. 17) at 3:12 p.m. EST (2012 GMT). With unacceptable weather at KSC restricting preparations for STS-133′s Tanking Test, managers decided to delay the test until at least Friday. With the Program Requirements Control Board (PRCB) approving the plan to collect data from ET-137′s stringers, a decision was also taken to roll the stack back to the Vehicle Assembly Building (VAB) next week – allowing for further inspections of the tank. Saturn’s majestic rings are the remnants of a long-vanished moon that was stripped of its icy outer layer before its rocky heart plunged into the planet, a new theory proposes. The Geminids promise to be the best meteor shower of the year. They are hitting a peak just in time for the holidays, but skywatchers should act fast: This sky show peaks overnight tonight. NASA has not heard from the experimental NanoSail-D miniature solar sail in nearly a week, prompting officials to wonder if the craft actually deployed from a larger mother satellite despite initial indications it ejected as designed. The Akatsuki space probe suffered a sudden, dramatic loss of balance two minutes 23 seconds after commencing an unsuccessful attempt to enter orbit around Venus on Tuesday for an observation mission, the Japan Aerospace Exploration Agency said Wednesday night. Space Exploration Technologies (SpaceX) has quickly rebounded from the discovery of cracks in a nozzle on the upper-stage engine of its Falcon 9 booster and is moving ahead with plans to fire off the rocket on Dec. 8 to put the company’s Dragon capsule into orbit on a demonstration run for NASA. Japan’s probe “Akatsuki” will attempt to enter the orbit of Venus on Dec. 7, and if successful it will become the first Japanese probe to orbit another planet. On the morning of Dec. 7, Akatsuki will reverse the thrust of its engines for about 12 minutes, reducing its speed before attempting to enter an elliptical orbit around Venus. The Indian Space Research Organisation (ISRO), on the sidelines of the visit of French President Nicolas Sarkozy, announced the renewal of a five-year contract with European space firm EADS Astrium to build commercial satellites to be launched from French space facilities. A Russian Proton-M carrier rocket launched from the Baikonur space center in Kazakhstan will deliver three Glonass-M satellites into orbit on Sunday to complete the formation of Russia’s global navigation system, a spokesman for the Russian space agency Roscosmos said on Sunday. The private spaceflight company SpaceX test fired the nine engines of its second Falcon 9 rocket on Dec. 4, 2010 at Cape Canaveral Air Force Station in Florida ahead of a planned Dec. 7 launch to test the company’s new Dragon space capsule. Following the decision to move Discovery’s STS-133 launch date target to No Earlier Than (NET) February 3, NASA managers have begun realigning the International Space Station (ISS) manifest. An April 1 placeholder has been selected for Endeavour’s STS-134 mission, while Japan’s HTV resupply vehicle is also involved in supporting the manifest changes. Space-X will now begin its webcast at 9:00 AM Phoenix time (11:00 AM EST). The static test firing is scheduled for 10:00 AM Phoenix time (17:00 UTC). The X-37B mystery space craft launched by the US Air Force on 22 April 2010, has returned to Earth after a 220 day mission. What the mission was, no one is talking. Aviation Week discusses a Space-X response to NASA’s Heavy Lift requirement. Elon Musk states that scaling the Merlin engine to 1.7 million pounds of thrust and mating it to three Falcon 9 cores would yield a three stage rocket capable of delivering 150 mt to orbit. Development costs would be $2.5 Billion. The main and backup crews of the new long-term expedition to the International Space Station (ISS) on Friday few from the Chkalovsky airport outside Moscow to the Baikonur cosmodrome, the Cosmonaut Training Centre outside Moscow told Itar-Tass. The Launch of the Soyuz TMA-20 spacecraft that will take to orbit the ISS-26/27 Expedition crew, is scheduled for 22:09 MSK (19:09 UTC) on December 15, its docking with the ISS – for December 17. At a press conference scheduled for Noon Phoenix time on Thursday, 3 December 2010, NASA is expected to announce the discovery of a bacteria that substitutes Arsenic for Phosphorous in its metabolic system. This expands the realm that extra-terrestrial life can occupy. Aviation Week reports that the US Air Force is preparing to land the X-37B spy space-plane between 3 and 6 December 2010. Here is a graphic review of big events in the Solar System. Space-X is preparing for the second launch of its Falcon 9 rocket and first live Dragon capsule on Tuesday next week. Erection is scheduled for tomorrow, Thursday, and a live fire test on Friday.